Inaugurated in 1841, Anhalter Bahnhof was one of Berlin’s most important train stations. From 1942 to 1945 over 9,600 Jews were sent from here to Theresienstadt, Czechoslovakia. In the final months of Second World War the building was destroyed, now proposals have been lodged for this to be the site of the Exilmuseum. All that remains of the façade of Anhalter Bahnhof, central Berlin - January 2019. Not far from Potsdamer Platz are the somewhat meagre remains of what was one of Berlin’s most important passenger train termini. All that remains today of Anhalter Bahnhof, described as the ‘gateway to the south,’ is the central portion of the station’s façade. Anhalter Bahnhof was opened to the public on 1 July 1841. It took its name from the historical state of Anhalt, through which trains from this station would run. Although starting out as a modest station, it went on to become one of Berlin’s most important stations, with trains to and from Leipzig, Frankfurt am Main, Munich, Vienna and Prague near the end of the 1800s. Destinations at the beginning of the 1900s included Rome, Naples and Athens. World War Two changed the fortunes of this station, and how this station would be remembered. The Anhalter station was in the way of Hitler’s grand plan for Berlin to become the world capital Germania. Albert Speer’s, Hitler’s architect for the project, North-South Axis severed the tracks from the Anhalter terminus. In Speer’s plans the station would have been demolished to be replaced by a vast public swimming pool. The war put a stop to Speer’s building programme, and the station took on another more sinister role. The central portion of the façade as seen from behind, and the proposed site of the Exilmuseum in Berlin. On 2 June 1942, at 06.07 am a train carrying 50 elderly Jewish men and women left platform one. Their destination? Theresienstadt – in what was then Nazi occupied Czechoslovakia. From then until 27 March 1945 116 departures would carry over 9,600 elderly Jewish citizens of Berlin to Theresienstadt. 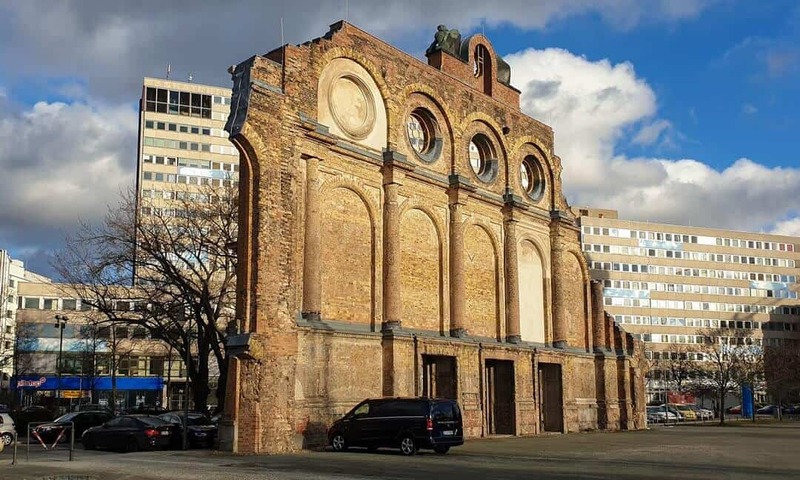 Anhalter Bahnhof was one of three stations in Berlin (the others being Bahnhof Grunewald and Moabit Goods Depot) from which over 50,000 Jews were transported from Berlin to their deaths in the ghettos and extermination camps in Nazi controlled eastern Europe. Anhalter was a regular station and the Jewish men and women boarded a regular, scheduled departure for Czechoslovakia. The only clues that they were not regular passengers was the yellow stars they were forced to wear and the fact they were surrounded by guards. They were made to travel in two specially consigned third class carriages. These 116 journeys became known as the ‘old peoples transports’. The Nazis described Theresienstadt as a ghetto for the aged. In fact it was a transit camp. For those who survived the journey, who did not die of exhaustion or disease were sent further east to the concentration camps, mainly Auschwitz. Left: A model of the Anhalter Bahnhof on display in the Deutsche Technikmuseum. Photograph © Roehrensee. Right: A photograph taken around 1951 of the station, showing the extent of destruction from Allied bombing during World War 2. Photograph © Deutsches Bundesarchiv. 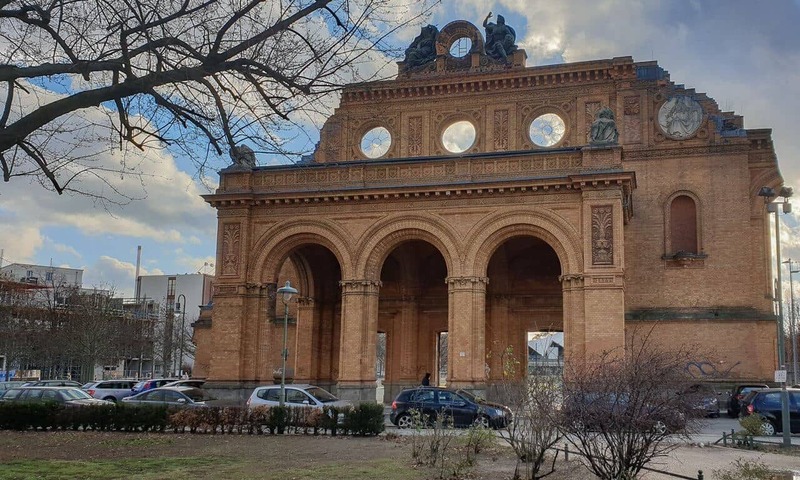 As with much of Berlin, Anhalter Bahnhof suffered significant damage from British and American air assaults and Soviet artillery attack. By the end of the war, the station was barely functional. But it would be Cold War politics that would be the final downfall of this station. With Berlin controlled by the Allied Occupying Powers, trains from Soviet-controlled east Germany would end their journey at Anhalt Bahnhof – located in a sector controlled by the West. A thorn in the side for the Soviets. Until in 1952 all trains to and from the east were directed to Ostbahnhof. Anhalter was closed, and lay derelict until it was demolished in August of 1960. Except for the central portion of the façade that still stands today. 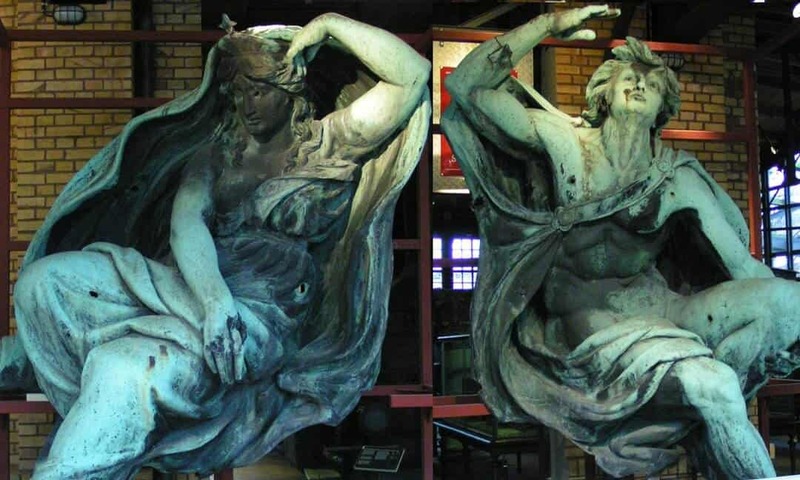 On this surviving portion of the station’s front was a pair of sculptures created by Ludwig Brunow, entitled Day and Night. They survived the war even if the clock they flanked did not. But their position and condition was considered to fragile and so they were removed from the building to the nearby German Museum of Technology. The Day and Night sculptures are a reworking of similar early 16th century sculptures made by the Italian Renaissance artist Michelangelo Buonarroti for the tomb of Giuliano di Lorenzo de’ Medici (the Sagrestia Nuova) in the Basilica of San Lorenzo, Florence. The sculptures are allegorical representations of Night as a woman and Day as a man. Just as Night, on the left, starts to fall asleep, Day, on the right, awakens. The eternal cycle of life. In retrospect, not the most appropriate symbolism to decorate what would become one of Berlin’s most notorious railway stations. The original Day and Night sculptures from the façade were removed from the ruin and are now housed in the Deutsche Technikmuseum, Berlin. A public sports field, with a synthetic surface (not quite Speer’s swimming pool), and a large concert venue, the Tempodrome, have replaced what was the terminus and train shed. The space immediately behind the last remnant standing has been proposed as a location for the Exilmuseum, a project of the Siftung Exilmuseum Berlin. Although the rail terminus was destroyed, there is an underground S-Bahnhof of the same name. This station is on lines S1, S2, S25 and S26. To reach the remains of the above ground station, head off the platform to the exit for Stresemann Strasse and Schöneberger Strasse. Also use this stop for the Berlin Bunker Story (actually this is what was the Anhalter Station air raid shelter) and the Topography of Terrors.